news archive - a2b ecycle - electric bicycle, sales & rental co.
How do you continue to make cycling a regular, integral part of your life even as your body starts to show its age? 74-year-old Bob Gellert solved this roadblock by turning to an e-bike. Bob has been a biking enthusiast since he was nine years old, and has biked through two heart attacks, a quad-bypass, and four stents. Since purchasing his bike in May 2011, he has continued to cycle all over Washington State, with no signs of stopping. “I’ve been biking since I was about 9 years old and the desire to keep on biking has never left me. Over the years, I’ve had two heart attacks, a quad-bypass and 4 stents. About 10 years ago I decided to purchase an electric motor for my mountainbike, just in case I became too tired to pedal back to my car. I could venture out and have a “back-up” plan if I needed it. The bike had a simple thumb throttle and a lead acid battery that weighed so much, I couldn’t lift the whole thing into the pick-up without taking the battery off first. Fast forward 10 years. Last May I looked for new“higher-tech” electric bike. I thought that letting a computer decide when and how much power to add to my pedaling might be easier than keeping my thumb on the throttle and guessing how much to add. More importantly, my “pedal-power” could remain constant, so I get lots of continuous exercise without getting “toasted” by the hills. I went on several test-rides from the Seattle store before purchasing my OHM electric bicycle. It didn’t look to be a fun demo day for those presenting their conventional bicycles. Pitched tents were crowded with reps and brand new bicycles, waiting to be asked out for a spin. But of the thousands of bicycle industry people who had descended on the small town of Ratzenried for Eurobike’s annual Demo Day, hardly a soul was interested in trying an old-fashioned bicycle. For those with ebikes, the problem was keeping the batteries at full capacity, and having a few bikes available for the line of eager riders. Yes Eurobike’s demo day, like the rest of the European bike market, is now all about electric bikes. And the darling of the European ebike market at the moment is Bosch. Introduced to the market in 2010, Bosch is now the system spec’d by a growing roster of manufacturers. The Bosch is a mid-drive system, meaning the motor drives the front chainring, taking advantage of the gears in the rear. It’s popularity, manufacturers tell me, is due to a combination of great reliability, competitive pricing, quick to market innovation, and, most importantly, performance. The Bosch electric bike display. Demo day was my first experience of the system. What was my take? That will have to wait for my wrap-up post later in the week, but suffice it to say Bosch is very nice. The good news, or bad news, depending on how you look at it, is that Bosch is not the Microsoft – or Apple – of drive systems. Competition is fierce, and the market is developing at a feverish clip. Panasonic has introduced larger capacity battery packs, further adding to it’s edge in having something for everyone – you can have a Panasonic battery of up to 604 Watt Hours now – along with a new hub drive. TransX from Taiwan was also out in force, delivering a mid-drive system that many manufacturers are experimenting with. And Bionx is still being built into many bikes, especially by the German brands Wheeler, KTM, and Grace, although many in the industry grumble over Bionx’s lack of focus after Daimler ordered up 15,000 of their motors for their Smart ebike. There are also a growing retinue of proprietary, or semi-proprietary systems by manufacturers, with Stromer, BH Easy Emotion, and Kalkhoff chief among them (Kalkhoff has developed their own “Impulse” motor system to sell alongside Panasonic and a little Bosch). The more proprietary route allows for easier integration, but also makes retailers anxious to know if they can trust the brands to stick around. The bigger the brand the better when it comes to proprietary technology. When all the systems and technologies and implementations are taken together, the variety can be a bit overwhelming. Coming from the U.S. where quality options are few and far between to then see so many good systems vying for primacy takes a bit of time to recover from. The e-bike and pedelec market is still flourishing. An increasing number of manufacturers are presenting their models at the EUROBIKE. The Zeppelin Hall and the Open Air Grounds East plus the neighbouring Messestraße are dedicated to the subject of pedelecs and e-bikes again this year. This allows visitors to have a go at cycling with an e-bike or pedelec on the exhibition grounds. With three keen cyclists we headed to Blenheim in the van and on Friday the 20th left from the Alan Scott Winery, with heaps of keen cyclists on Day 7 of the tour of new zealand cycle tour, the last section - Blenheim to Havelock and on to Picton via the beautiful Queen Charlotte Drive. My team "it's all cyclelogical" Theresa, Petra and Timbo all excited and ready to go. Ecycles used - 'kea', 'kakapo' and 'hawk'. Funky Nutcase helmets used and a head cam. A few comments at the start line on the electric cycles, photos taken by intertested folk. Then it was time to go. I drove to meet the team at Havelock and check batteries and replaced two just in case, before the hills on queen charlotte drive, Didn't change the battery on Timbo's ecycle as was sure we would get to Picton on 1 battery charge. around the bends and up and down the hills, with a bit of passing of other cyclists here and there, particularly on the hills, arriving in Picton on 1 battery charge. AWESOME RESULT. 2 hours 58 minutes. (with 3 short stops). 130th out of 180. Once upon a time, only a small number of Parisians rode bikes, but the French capital city's Velib bike rental system has shaken up the way locals move from Point A to Point B. Five years after their debut, cycling has become cool in Paris -- and there are fewer cars clogging up the city center. But Velib has brought affection for two-wheeled travel into the country's capital city. The self-service network of 23,500 bikes parked at 1,400 stations across Paris has made mobility more flexible for city dwellers willing to pay an annual €29 ($36) membership fee. The first half hour on the bike's solid, heavy frame is free of charge. After that the hourly rental rate gets increasingly expensive, a price structure designed to push Velib as an alternative to car, bus and metro trips. 'Not Just A Weekend Hobby'Some 130 million trips have been clocked up since the bike network's launch five years ago. The anniversary was markeon Sunday with a mass cycle ride down the Champs-Elysées. The success story has shifted attitudes to mobility in the French capital. A few years ago it was unimaginable that suited businessmen or elegantly dressed women would mount a bike. Eric, a sociologist at the University of Seine-Saint-Denis, swears by the city's bikes which he uses "at least twice a day." The 48-year-old is faster on the saddle than in the subway: "The Velib station is just over the road from my front door," he says. And the daily newspaper Le Parisien quoted a member of the Velorution cycling organization as saying, "The invention has proved that a bicycle can be a serious means of transportation, not just a weekend hobby." workers who commute by bicycle. The rental bikes have proved their worth, particularly for short trips. While cars grind through the boulevards at walking pace, speedy cyclists can cover about five kilometers (three miles) in 20 minutes, whizzing past the gridlock. The system's teething problems, such as where to find bikes and which stations have parking space, have largely been solved: More than a dozen free smart phone applications, including "Open Bike," "Cycle Hire" and "molib," direct Velib riders to the nearest parking space. Some 110,000 Velib trips are made daily, half of them by people traveling to and from work, says Jean-Charles Decaux, chairman of the company that won the concession from the city to launch the bicycle rentals in 2007. The renaissance of the bike has been evident in the number of people using their own bike to dash around the city, a figure which has swelled to up to 200,000 trips every day in Paris. years, the number of cyclists in Paris has increased by 41 percent. That jibes well with the city's goal. The French capital has spent years trying to lure people onto public transport, especially to greener forms of transport. Over the weekend, as part of an event called "Paris Respire" (Paris breathes), large parts of waterside roads, including the picturesque Canal Saint-Martin, were reserved for pedestrians and bicycles. Motorized traffic has fallen by a quarter over the past five years, partly due to Velib's success, according to Paris Mayor Bertrand Delanoe. The innovation has sparked a trend. These days, 34 French cities have bike rental programs. With similar systems at work in Montreal and Melbourne, Mexico City and Milan, Le Parisien writes that the rental bike has become a "global phenomenon". A Green Avenue from Paris to London. Adding to the cyclists' obstacle course, mopeds and motorcycles often illegally travel on bike paths when the traffic is dense. But Transport Ministry official Lebrun remains optimistic: "Over time there will be fewer accidents as car and motorcycle riders pay greater attention." Since a record 694 cyclists were injured in 2007, the total number of bike accidents has declined steadily each year in Paris. Beyond the cities, France hosts a network of bike paths totalling approximately 8,000 kilometers. A further 10,000 kilometers are planned over the next 10 years. The first cross-country route is under construction between the Breton port of Roscoff and the Atlantic coast city Hendaye, called the "Velodysee" And over the weekend French cyclists set off along the "Avenue Verte," or green avenue, a new path linking London and Paris. Depending on the route, the journey is between 408 and 474 kilometers long. On the French side, it uses sections of former railway lines between Paris and Dieppe and has no steep inclines. The new route was hailed by Le Monde as being a good step for "tourism, sport, culture and the environment," but cyclists are only given the exclusive right of way on a third of the trail. The rest is shared with cars. "It's just a beginning," said Didier Marie, president of the Seine-Maritime region. "Bike paths will be added to gradually improve the route." segment were the junior mountain and freestyle bikes, which rose, thanks to a wider range of models, over 50%. Market trend to more e-bikes continued Special bikes, such as folding bikes and tandems saw the largest increase in volume. The market trend to more e-bikes and less 'normal' city bikes continued in 2011 as in the past years. Last year just 102,000 regular bikes were sold, a decrease of 12%. The market share oure muscle-powered bikes in the entire city segment dropped to below a third. This decrease was of course in favor of electric bikes, which rose strongly again, though 'only' by 25%, or 10,500 units, to nearly 50,000. Since the majority of these e-bikes are also used in everyday life, you could speak of a second city bike segment called 'electric'. With the new sales record for e-bikes, the total fleet in Switzerland grew to over 150,000 units. That's just over 5% of the 2.8 million bicycles circulating on Swiss roads. MUNICH, Germany - The sales statistics in Germany clearly show the increasing popularity of e-bikes and pedelecs. According to the German Bicycle Industry Association (ZIV), sales have almost tripled since 2008. No wonder the Munich Ispo Bike puts a focus on this rapidly expanding market. The latest e-bikes and pedelecs, as well as general trends, will be introduced at Ispo Bike 2012 from August 16th to 19th at Messe München. The E-Mobility Hall will once again offer both theory and praxis: the E-Bike and Battery Safety exhibition and a side event program presented by trade show partner ExtraEnergy e.V. offering comprehensive background information. Indoor track area: The 4,580 square meter indoor track area, including a 50-meter-long ramp with 10 % incline and the outdoor speed track invites you to test the electronic innovations on site. More than 25 exhibitors have already reserved the Check-In booths lining the track. Transport for London commissioner Peter Hendy has outlined a 25-year plan to make cycling the preferred method of transport for local journeys. In front of an audience of professional planners and policy makers at the Chartered institute of Logistics and Transport, he made the case for a programme of measures to herald what he called "the Century of Cycling". More cycle training, not only for cyclists – both adults and children – but also bus and lorry drivers, to help reduce the 40 % of cycling accidents that involve a heavy goods (HGV) or passenger carrying vehicle (PCV). real advances of recent years in London and in some regional towns and cities can fan out across the country." fallen from around 60 per billion kilometres in 1980 to between 20 and 25 today. improvement in cycling safety per kilometre cycled (ie. cycling rates rising faster than accident rates). You may have heard of EVELO Electric Bikes from the TransAmerican Electric Bike Tour (from New York City to San Francisco). That is because the CEO, Boris Mordkovich, was one of the riders on the tour! Boris and his riding partner, Anna Mostovetsky, completed their tour earlier this year and they definitely raised awareness about electric bikes across the U.S.Boris and Anna rode EVELO’s Aries&Aurora on their 4,000 mile trek. Here is an interview with Boris about their trip. I recently had a chance to put some miles on their Lunaelectric bike. The Luna is a commuter/casual recreational type of electric bike. It has the step through frame that makes it easy to get on and off of and it comes with almost every accessory you can think of! The Luna is not super high performance but it is a smooth, quiet and mellow ride. This can be a perfect fit if you are looking for a trusty, predictable, and comfortable commuter to get you around town. Make sure you check out the video, large pictures and specifications of the EVELO Luna. The EVELO Luna electric bike mid drive motor.The Luna uses a mid drive motor that provides power to the cranks of the bike. There is a throttle option (you have the choice of pedaling or not) and there is the pedal assist that provides power while you are pedaling. You can vary the throttle power via the twist grip on the left side of the handlebar. If you elect not to pedal in the throttle mode, the chainring will turn but the cranks will remain stationary via a freewheel in the crankset. The pedal assist feature has 3 settings (low, medium and high) that can be adjusted on the display on the left side of the handlebar. Changing these settings will vary the pedal assist the bike provides and can increase the bikes range by using a lower assist setting. The EVELO Luna electric bike Shimano Nexus 3 speed hub shifter and bike computer. Note faux leather grips! The 3 speed internal hub keeps things simple by providing just a few gears to choose from for climbing hills and cruising on the flats. The twist grip on the right side of the handlebars shifts the gears and there is a gear indicator that will show you what gear you are in. lbs and I pedaled very lightly this is very good range for a 36 Volt 10 ah battery pack (360 Watt Hours)! This big range is probably due to the fact that the Luna tops out at around 15 mph (less wind drag or “losses”compared to higher speeds) and the mid drive systems can be more efficient when climbing hills. Watt hours are the total energy in a battery pack and it is based on the volts x amp hours of a pack. This is a way to compare the size of the “gas tank” of electricbikes. casual, comfortable commuter with a lower speed. The other EVELO models, the Aries and Aurora, top out around 20 mph because they use higher gearing. Weight: This bike tips the scales at 65 lbs. The weight distribution on this bike is pretty good because the motor is centered in the middle of the bike and low to the ground. The battery pack is on the rear rack. Mid Drive Motor: Mid drive motors are pretty efficient and they can climb steep hills well because they can use the gears of the bike to keep the electric motor perating in an efficient RPM range. The idea is similar to a car where the motor can shift through the gears of the car’s transmission to keep it in the best gear for the terrain that it is driving over. Quiet motor: The Luna’s motor is pretty darn quiet. Occasionally you can hear a whir from the gear box but other than that it is almost a silent ride. This is a nice feature and further lends itself to a mellow ride characteristic of the Luna. Lots of accessories: The Luna is decked out! Front and rear LED lights that run off the lithium ion battery, fenders, cycle computer, rear rack, and kickstand. It is nice to see that this bike is ready to hit the road. Step thru frame: The step through frames make it so easy to use this bike. It actually took me a little while to get used to not throwing my leg over the saddle! Just step onto the bike and away you go. 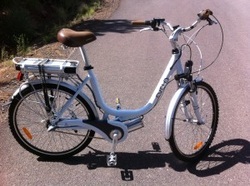 The EVELO Luna electric bike gets a lot of range from its 36V 10ah lithium ion battery! Great Range: This is the one feature that really stood out to me. 27 miles of range on a 36V 10ah lithium ion battery on a hilly route is very impressive! This is most likely due to the fact that the bike topped out around 15 mph with electric assist (you can pedal harder if you want). If this bike assisted up to 20 mph I bet the range would be less, but even then it probably wouldn’t be that much less. I think the middrive motor also helps with range, especially on the hilly terrain I rode the bike on. Good climber: Because the mid drive motor can be shifted to a lower gear it makes this bike a good climber, especially when it comes to steeper hills. It won’t fly up the hills because of the 250 watt motor, but it will get up them without getting bogged down. Versatile tires: The tires work well for both on road and some light duty off road. They have a slick center patch with some knobby tread on the sides. I rode the bike on some gravel roads and rocky trails and the bike handled well. The EVELO Luna electric bike uses the Shimano Nexus 3 speed internally geared hub. Upgrading to NuVinci N360 continuously variable hub is an option. Shifting under pressure: One of the biggest issues with mid drive motors and some internal gear hubs (not the NuVinci) is that they don’t shift well under pressure. When trying to shift to an easier gear on a climb it can be hard to get the hub to shift to that lower gear because of the pressure the motor puts on the chain. Even if you stop pedaling there is a little delay until the motor stops assisting, so you can loose your momentum on a climb. I did find that using the throttle on a climb worked better because the motor would turn off as soon as the throttle was released and I could shift to an easier gear and then hit the throttle again. You can still be pedaling in this scenario too. Please note that if you elect for the upgrade to the NuVinci N360 hub that you will not have any problems because the NuVinci shifts well under pressure. Also, please note that I have experienced this on other electric bikes with a similar mid drive motor and an internally geared hub (excluding the NuVinci N360). Brakes: The front and rear brakes had differ amounts of power. The front V-brake is more powerful than the rear roller brake. This is something you can get used to but personally I like to have a balanced amount of power between the front and rear brakes. Assist settings: Even though there are 3 assist settings I found myself only using the high assist because it seemed to provide the right amount of power (remember this bike is mellow!). If you ride in areas that have a lot of pedestrian traffic then these lower assist settings will probably be useful, but for general street and bike path riding they seem too low. The EVELO Luna electric bike with mid drive motor.If you are looking for a casual and comfortable electric bike the Luna should be one that you consider. The step through frame, upright position, simple 3 speed hub, and well equipped accessory package make the Luna a great e-bike to get on and go! many times and it is a very smooth system! Overall I really enjoyed riding the EVELO Luna. It was an easy bike to ride and it felt very comfortable. Please keep in mind that this is a relatively short term test. This testing can’t really give you the long term review of durability and reliability. My thoughts on the quality of this bike are from previous experiences with similar bikes. 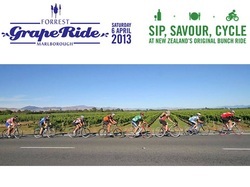 Saturday 6th April: Grape Ride, the South Island’s biggest and most popular recreational road cycling event. We are looking for 4 cyclist to participate in Grape Ride in a2b-ecycle colours. We will provide our electric bicycles for free, transport and the fees will be paid for you! Don't miss such a great opportunity to "sip on some world class wines, savour the best of local cuisine during the weekend and cycle a truly memorable ride." The 5 Mile Commute – Are Electric Bikes the Answer? The commute to work ramps up the worry factor, it makes you angrier, fatter, sleep less, more likely to divorce and triples your risk of a heart attack. America is an aging nation, and about two-thirds of our population is overweight or obese. This makes it tough to sell the idea of using human power for transportation. For someone who hasn’t biked in 20 years, even a one-mile ride might seem overwhelming. Electric bikes, however, are one option for those willing to give bicycling another try.